"There is no fake whatever about them. I closely examined the injuries afterwards. I must confess I would never have believed some of them possible had I not seen them myself." So testifies Dr. R.L. Spittel in his book Far Off Things after seeing the performance of the Riffayee Rathib, a form of self-torture while in a state of spiritual ecstasy, performed by the Riffayee sect of Muslims. The head of this sect, His Holiness P. P. Yoosuf Koya Thangal of Androth Island told me: "There is no mummery or mumbo-jumbo about it. Anyone is invited to see this ceremony. It's faith, strong faith." 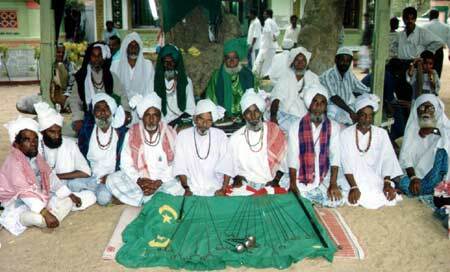 For 79 years at the Kapuwatta Jumma Mosque, Weligama, a full-scale "rathib" has been conducted. 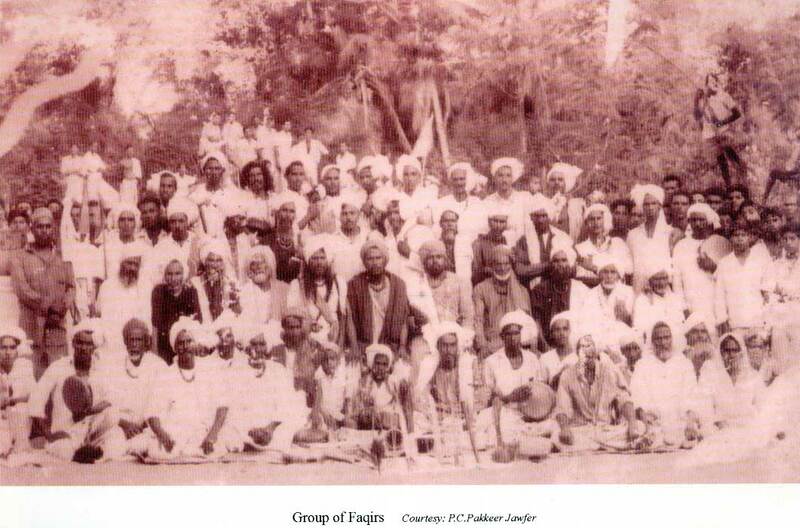 These rathibs have been held in India, Singapore, Indonesia, UAB, Laccadives and other parts of the world where members of this sect live. Every Thursday night (Friday eve to the Muslims) the rathib is recited at the Mohideen Mosque in 1st Mosque Lane, Colombo-12. It is held in honour of a 12th century Muslim saint of Iraq. Sulthanul Arifeen Al Seyed Ahamed Al Kabir Hussanur Riffayee and the saint's name is invoked during the "rathib" with frenzied cries of "Ya Sheikh!" (My Master) and abdomens and other parts of the body slashed—without harmful injury or casualty—while the rathib recital and beating of drums rise in crescendo. It is awe-inspiring but a wonderful sight to see—from the recital of Fathiha and the formulative invocation "Lil Assiki fil hawa dala hil, La yasmahu minkala mihadil" to the frenzied "Hoo hallah, hoo hallah" towards the end. 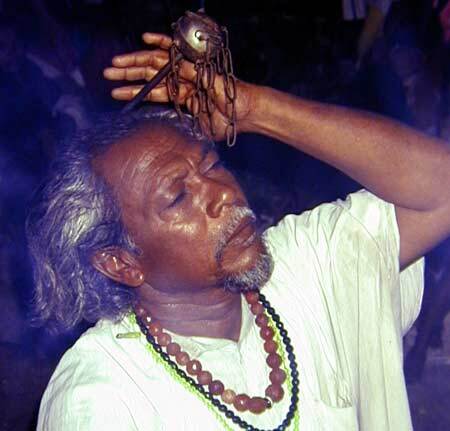 According to the Riffayee sect head Pookoya Thangal the rathib starts with the re­cital of "Fathiha" from the Holy Quran. Under a cloth awning the Thangal leads the recital of the rathib facing rows of devotees seated on a mat on either side (leaving a space of five to six feet)—some with rabans (tambourines without the loose metal discs). As the rathib recital splurges into a crescendo the tambourines are beaten furiously and the air appears eerie with incense smoke billowing from braziers and the intonations and the drum-beats reverberating all over. In a box on a mat is a collection of implements—swords, kris knives, skewers and other types of weapons with sharp edges. While the rathib recital resounds and the drums throb the devotees slash abdomens with swords, impale their cheeks and biceps with skewers, incise their arms, have long spikes passed through the floor of the mouth, ears, breast and wrist. "He rose, a kris in each fist, and strode slowly up and down between the lines of drummers. Suddenly he halted and gazed intently towards the cloth awning, and he saw something beyond. Holding up the knives he shouted: "Ya Sheikh" (My Master). 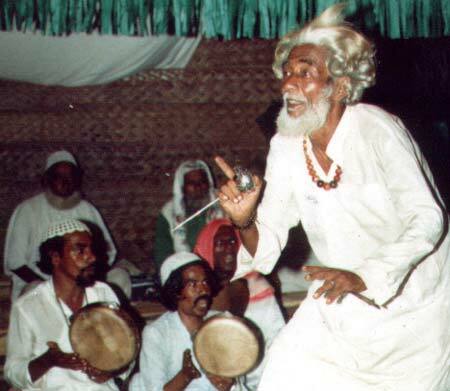 "He commenced springing backwards and stamping in accord with the drum-beats, shouting ‘Ya Sheikh' from time to time. "Quicker and quicker he leapt: the drumming changed from double to triple time, but all that could not outpace his agility. "His arms crossing and uncrossing them over his abdomen with lightning rapidity in slashing movements…he did this with a violence of gesture that suggested evisceration when one remembered the razor edges with which he so recklessly played. "Watching him closely we saw no trace of blood and surmised that here was only knife playing falling short of injury. Even so, the manly grace and careless truculence of his performance was a reward in itself. "But now as he moved towards us, we became aware of a messiness on the dark skin as the blood trickled down from a score of horizontal cuts, so deftly inflicted as to leave the muscles unscathed. Gory splotches stained his white cloth. "Then ‘Ya Sheikh!' and the mad passes again, the slashes and the bounds, with unabated vigour." "He has had enough. Unfolding his red waist band, he spreads it over his bleeding belly and returns the dripping knives to the priest, who places his healing hands on the wounds, uttering a short prayer. "He smokes his abdomen over the burning incense, has a drink of water from a handy vessel, and quietly joins the crowd." According to Pookoya Thangal the Reffayee Rathib is one of the most spectacular ceremonies and if performed the full length (it is abridged on certain occasions) will strengthen the faith of the Muslim onlookers. Leading a pious life as a Muslim and implicit faith in the miraculous power of the saint is all that is needed to participate in the ceremony according to the Thangal. "How they escape hemorrhage, at least in the form of extensive, extravasations is more than I can tell for the points of their implements are as sharp as knitting needles: there was no evidence of a drop of blood at the punctures, perhaps the vessels slip away, or any wound made in them becomes sealed off, as when an exploring needle is inserted into aneurysm. "Another point hard to explain is their immunity from infection, considering that the instruments used are quite unsterilised and picked off a mat: and sometimes even lubricated with saliva! "Especially is this difficult to understand in the case of those who transfixed their necks traversing pharynx and oesophagus, and of him who pierced his fore-arm just above the wrist joint through the bundle of tendons. "They attribute their immunity from hemorrhage and infection and their professed freedom from pain to the implicit faith in their saint and the healing touch of the seyid. "All the preparation they make for the Rathib is to have a bath and wear clean clothes. They certainly do not dope themselves with alcohol or drugs, which are prohibited by their religion. "The clean-living men of former times are said to have been capable of chopping chunks of flesh off themselves, cutting their tongues in two and handing the severed piece round for inspection, or even dividing themselves into halves and in all instances re­assembling the severed parts. "These may be fairy tales, but they cannot discredit those acts our eyes actually witnessed."